This chapter, consisting of six independently authored subchapters, including one subchapter, Glaciers of the Alps, that has four independently authored sections, is the fourth to be released in U.S. Geological Survey Professional Paper 1386, Satellite Image Atlas of Glaciers of the World, a series of 11 chapters. In each chapter, remotely sensed images, primarily from the Landsat 1, 2, and 3 series of spacecraft, are used to study the glacierized regions of our planet and monitor glacier changes. 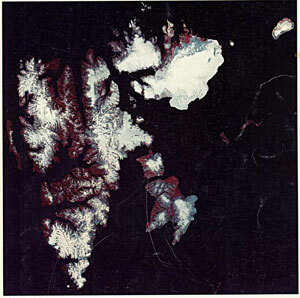 Landsat images, acquired primarily during the middle to late 1970’s, were used by an international team of glaciologists and other scientists to study various geographic areas or discuss glaciological topics. In each geographic area the present areal distribution of glaciers was compared, where possible, with historical information about their past extent. The atlas provides an accurate regional inventory of the areal extent of glacier ice on our planet during the 1970’s as part of a growing international scientific effort to measure global environmental change on the Earth’s surface. Landsat false-color image mosaic of Svalbard, Norway, a heavily glacierized archipelago situated about 900 kilometers north of the Norwegian mainland. Mosaic compiled by Fjellanger Widerøe A-S. This report is available in Adobe Reader format. Right-click (PC) or control-click (Macintosh) on the links to download the PDF files.